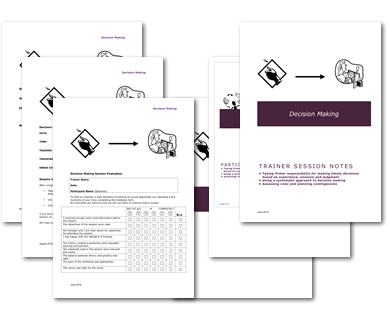 This Decision Making Session is one of a suite of core management skills sessions we have designed to help managers and supervisors to step up to lead as they achieve their first line management role. Newly appointed trainers who do not yet have a file of resources to turn to and a pressing need to do something in the time management space. More experienced trainers who want to check what they do against another approach. Individuals who want to do some self-development and are confident to work through the materials on their own, and complete the activities with the support and challenge of colleagues or line managers. Individuals who believe they could improve their effectiveness and performance by taking a first, or refresher look, at time management. Take firmer responsibility for making timely decisions based on experience, analysis and judgment. Use a systematic approach to decision making. Delegating and letting go of work relating to the previous role. Getting to know and create productive relationships with a new team of people. Picking up the reins of new operational and leadership activities to maintain business as usual and enhance the longer-term perspective. Hardly any wonder then that decision making responsibility figures so highly as a core management skill for any manager at any level of an organisation. Assess risk and plan contingencies for decisions. Increased competence in an essential core management skill that enhances results. Increased confidence to have more robust discussions about the importance of taking the best decision for all stakeholders. How will participants learn that? This is a short, interactive session with practical activities, discussion sessions and action planning, to ensure they can apply learning immediately. Duration: 2 hours 15 minutes.